Not everyone in Hong Kong has supported the protests. Hong Kong’s massive pro-democracy street protests appear to be fading. Student-led protesters and the Hong Kong government have met for talks, as the number of demonstrators on the street dwindles to the hundreds. This gradual dissipation contrasts with the major escalation seen on Friday, when a well-organized group of counter-protesters clashed with pro-democracy activists camped on the streets of Hong Kong’s Mong Kok district. The massive protests – and their eventual dissipation without achieving their core demands – highlight crucial political trends within Greater China. In recent decades the Communist Party of China has secured its political monopoly primarily by guaranteeing economic growth and political stability. As long as Beijing can continue to deliver broadly improving economic conditions to the Chinese people, expectations of massive pro-democracy protests spreading to Mainland China are very unlikely to materialize. Moreover, Beijing’s massive and growing economic leverage over Hong Kong will translate into increased political influence in the territory. The core demand of the “Occupy Central” protest movement in Hong Kong is the right to freely vote to nominate candidates in the 2017 elections for the territory’s Chief Executive. Protesters reject Beijing’s recent decision to restrict the number and nomination of potential candidates. The student-led movement also seeks the resignation of the current Chief Executive Leung Chun-ying, who they see as being too close to Beijing. A shop owner in Hong Kong, who joined the forceful counter-protest in Mong Kok on Friday, cited economic reasons for opposing Hong Kong’s occupy movement: “The shops here all pay so much rent, and the customers are gone because of these protests.” Another pro-government activist said “It’s anarchy. These are our streets. What I oppose is anarchy.” Hong Kong police said of the 19 people arrested during the Mong Kok violence, eight were linked to the Triads, organized gangs that are hugely influential in the area. Whatever their motives and identity, the counter-protesters were vocalizing the psychological underpinning of China’s current relative political stability. People’s Daily has warned that “Hong Kong society will fall into chaos” if the protesters continue to act in defiance of law and order. Fears of “chaos” resonate deeply in a nation that, within living memory, suffered through the Warlord Era, a brutal Japanese occupation, a massive civil war, and the madness of the Cultural Revolution. Perhaps even more effective than appealing to collective fears is an appeal to personal interest. Hong Kong is now hugely dependent on Mainland China for trade, tourism, and investment. Conscious of this incredible economic heft, Beijing prevented tour groups from Mainland China from visiting Hong Kong when the protests were near their peak (individual travel was still permitted). 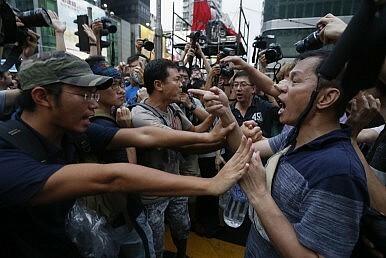 Opposition to disruptive protests in Hong Kong based on economic self-interest reflects views popular in Mainland China. When Deng Xiaoping started liberalizing the Chinese economy in the late 1970s, China’s per capita GDP was lower than Ethiopia’s. Now it is in the range of middle-income countries such as Serbia and Thailand. Hundreds of millions of Chinese have escaped chronic poverty, while the nation advanced from donkey carts to bullet trains in a single generation. Acquiescence to a successful government that provides substantive material benefits for its subjects is an ancient and persistently popular trend in Chinese thought. Chinese history has seen dozens of dynasties, many founded initially by peasant rebels or ethnic minorities. These new dynasties could claim the all-important Mandate of Heaven by providing social stability and material prosperity to their subjects. If the ruling dynasty could not deliver on these basic requirements (in the event of incompetence or major natural disasters), then it was said to lose the Mandate. When the political and economic system failed to provide for the people, challengers to the old order would receive a popular and ideological boost. Along with traditional notions of political authority, competing visions of nationalism motivate both the Occupy protesters and pro-government forces. Anti-mainland sentiment is prevalent in Hong Kong. During protests in 2012, Hong Kong’s Apple Daily printed a full-page ad featuring a gigantic locust (a symbol of Mainland Chinese) overlooking the city. The advertisement read, in part: “Would you like to see Hong Kong spend HK$1 million every 18 minutes on the children of non-Hong Kongers? Hong Kongers have had enough! We demand the unlimited infiltration of Mainland Chinese couples into Hong Kong.” More recently pro-democracy protesters yelled, “Go back to the mainland” at counter protesters at Mong Kok, as accusations circulated that the counter protesters were speaking Mandarin and being paid by Beijing. In Mainland China, outright censorship has accompanied media appeals for social stability and continued economic growth. Photo-sharing platform Instagram has been shut down in Mainland China in the wake of the Hong Kong protests, and certain search terms have been blocked on Weibo. However, there is still a large amount of (negative) press and television coverage of the protests in Hong Kong, as there has been since the early days of the protest. Instead of shutting down the discussion entirely, the Chinese government appears more concerned about guiding popular opinion along lines favorable to Beijing’s ends. The Chinese government’s strategy to stem major unrest in the Mainland and Hong Kong through delivering economic growth has been widely successful for several decades. Nevertheless, placing all of the CCP’s political hopes on continued rapid economic growth could prove risky. China’s crucial housing market is cooling, as worries mount of a significant economic slowdown and possible structural financial problems. Beijing’s leaders should be well aware that claiming the Mandate of Heaven solely through economic performance is a dangerous gambit – the last time Mainland China faced a major economic crisis, with yearly consumer inflation rates of 30 percent, was in 1989.